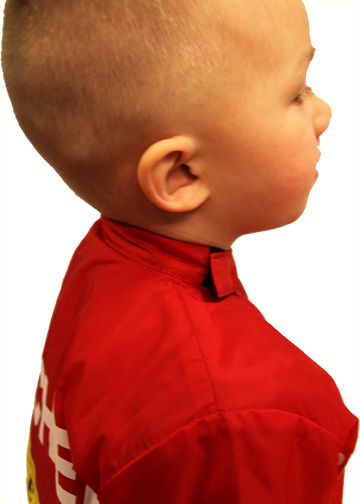 A Children's haircut system for kids, parents, Barbers and stylists! Download the Haircut Heroes App, read the storybook and play the matching games with your child to help familiarize them with the haircut experience. Locate a kid-friendly barber or stylist nearby! 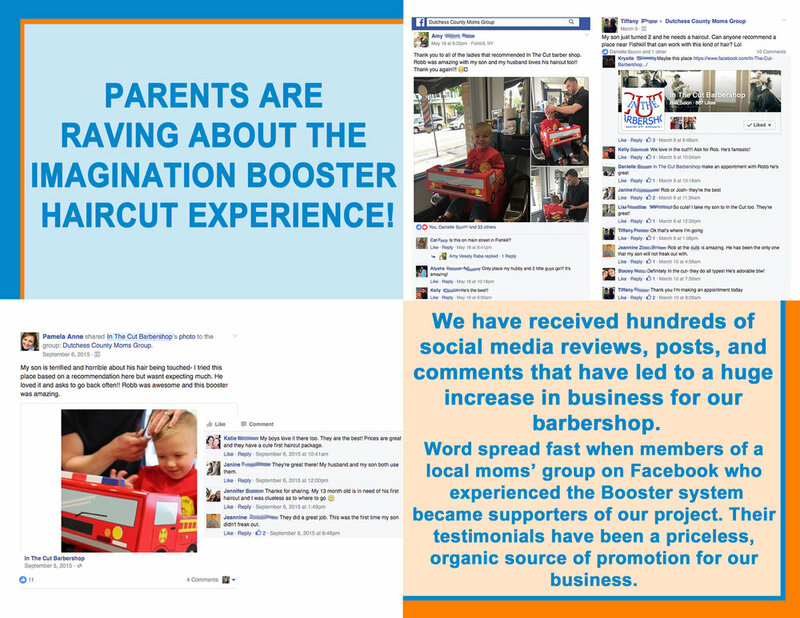 Receive discounts on Imagination Booster products and a FREE listing in our database for parents in search of a kid-friendly barber or stylist in their area. A Children's story and activity book to help familiarize them with the haircut experience. Read the story, Play the games, color the haircut pictures. TAKE THE FREE ONLINE CERTIFICATION COURSE TO RECEIVE Discounts on IMAGINATION BOOSTER PRODUCTS AND A FREE LISTING IN THE KID-FRIENDLY BARBER & STYLIST DATABASE. WATCH THE 1ST HAIRCUT INSTRUCTIONAL VIDEO WITH ROBB FADES AND READ THE STEP BY STEP PROCEDURES BELOW. 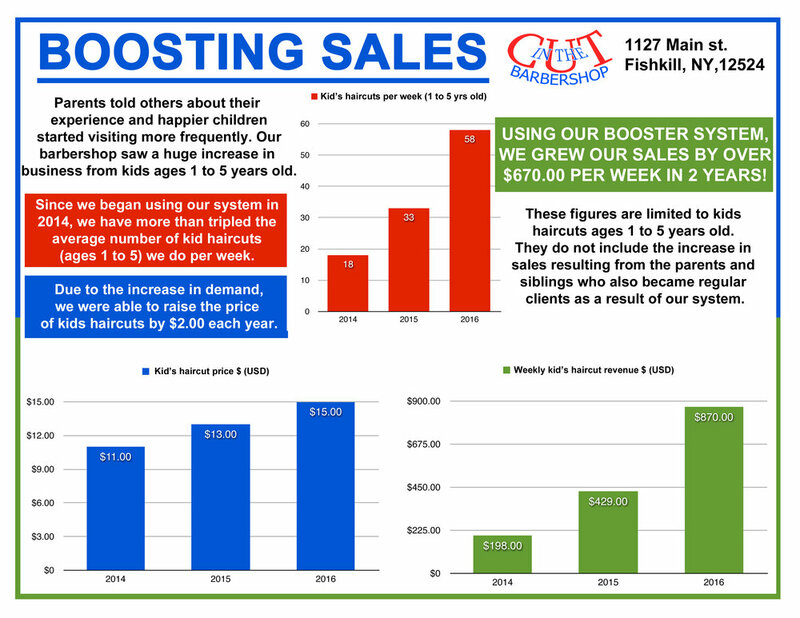 Pass THE QUIZ TO RECEIVE DISCOUNTS ON IMAGINATION BOOSTER PRODUCTS AND A FREe Listing AS A KID'S HAIRCUT EXPERT IN OUR NATIONAL DATABASE FOR PARENT'S SEARCHing for kid-frIEndly BARBERs & STYLISTs IN THEIR AREA! Recommend that the parents bring the child at a time of day that they usually have play time, it is always best to avoid attempting getting the haircut immediately before or after nap time or bedtime when the child is tired and more irritable. Boys should have their first haircut experience before the age of 2 years old, we recommend between 12-18 months. At a younger age kids are more open to new experiences and learning new things. Once they reach the age of 2 new experiences can be more frightening. Greet the child, introduce yourself to the child by name and learn their's. Ask them to give you five, all kids like to slap five. This familiar act will help you relate to the child. Recommend that the parents bring the child to the barbershop/salon prior to the visit that they are going to get their haircut, you may also have them watch their parent, sibling or someone else they know get their haircut first, helping them get familiar with the establishment and the haircut experience. Allow the parent or guardian to put the jacket on the child and secure them into the seat, it's better to have someone familiar do it instead of the stylist who is still a stranger. 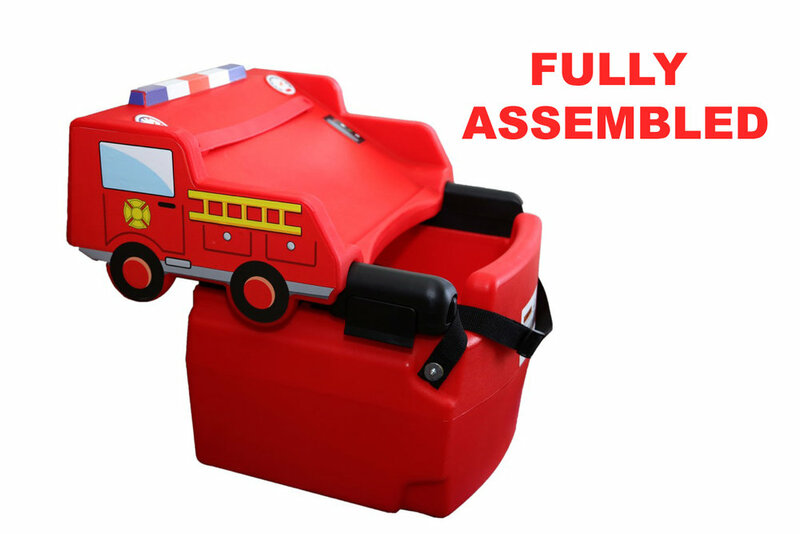 Secure the adjustable safety strap to the chair. Apply the neck strip and close the collar of the jacket to keep hair off of the child. Wash the cape regularly, HANG DRY ONLY. When choosing the tablet's programming for the child try to find age appropriate shows and games to hold the child's attention. For children under 18 months movies and shows containing familiar characters may be best while the older children may find the games more entertaining. Ask the parent or child what characters, shows or games they prefer. The tablet programming is especially important in keeping the child content for the duration of the haircut. understand what it is, and that it does not hurt. Use positive reinforcement, telling the child “good job”, “you’re doing great”, ect. helps the child stay positive throughout the haircut. Keep it Brief- All stylist/barbers want to give the best haircut possible, however children have a short attention span. Most of the time it is best to try to get the haircut done in a quick manner (12-15 min) so the child can leave having had a comfortable experience. For the first few haircuts recommend keeping the haircuts simple and as the child grows and gets more familiar with the establishment and haircut process they will be more able to sit still for more detailed haircuts. end delays any discomfort the child may feel. After the haircut is finished, clean off the child, remove the tray and have the parent safely remove the child. TAKE THE QUIZ BELOW TO BECOME AN IMAGINATION BOOSTER CERTIFIED KID CUT SPECIALIST, RECEIVE A FREE LISTING IN OUR ONLINE DATABASE, AND discounts on imagination booster products! 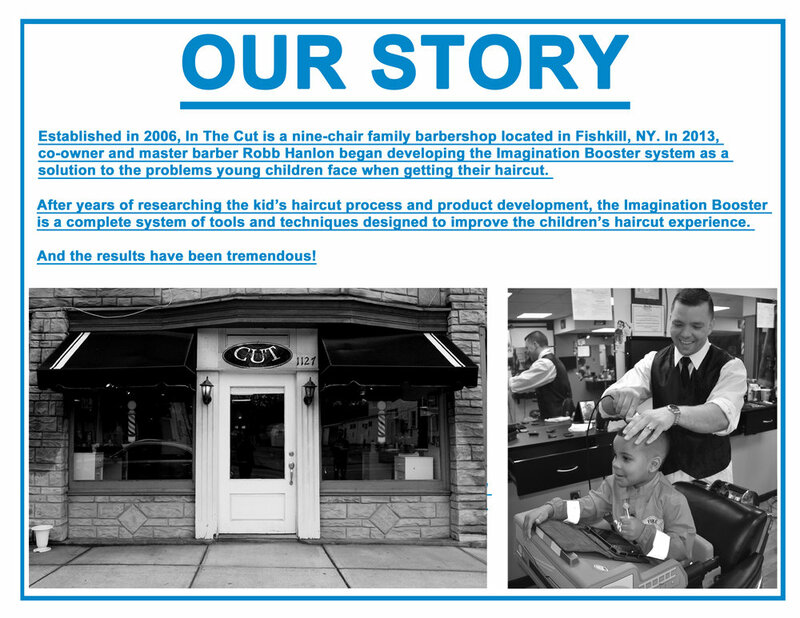 ENTER YOUR ZIP CODE TO FIND A CERTIFIED CHILDREN'S HAIRCUT SPECIALIST NEAR YOU! 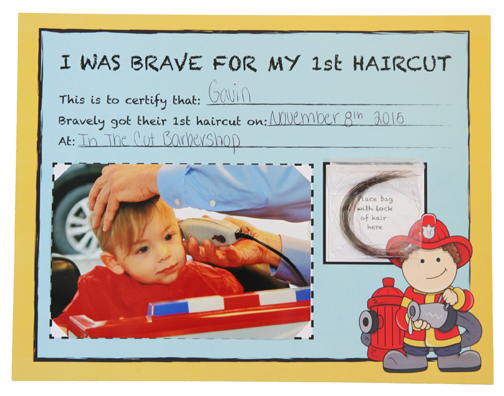 • Read the story I Was Brave For My First Haircut and play the matching game with your child to familiarize him or her with the idea of getting a haircut. • Schedule your child’s haircut at a time of day when he or she usually has playtime. Don’t plan a haircut right before or after naptime or near bedtime, when your child is likely to be tired and irritable. • Children should have their first haircut before age two, generally when they’re between 12 and 18 months old. Kids tend to be more open to new experiences and less frightened of them when they’re under two years old. 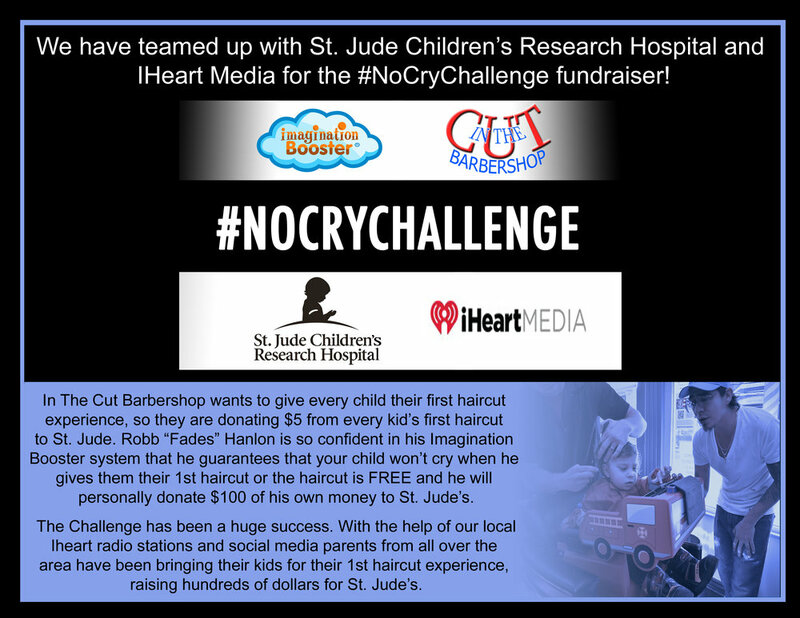 • Bring your child to the barbershop or hair salon before their first haircut to watch a parent or sibling get a haircut. This gives them a chance to get familiar with the place and the idea of getting a haircut so they’ll feel more comfortable when it’s their turn. • Comb your child’s hair thoroughly to untangle knots before his or her haircut. Removing knots can be painful and makes it harder for a barber or stylist to gain your child’s trust. The parent or guardian should put the jacket on the child and secure them into the seat, it's better to have someone familiar do it instead of the stylist who is still a stranger. • Let the barber or hair stylist offer your child a lollipop during or after his or her first haircut to make the experience more enjoyable. Although at Imagination Booster we don’t encourage small children to consume high-fructose corn syrup, a lollipop can be an effective way to pacify a child. The less often the child gets the treat, the more special it will seem during the haircut.